The historian, Paul Barnett, examines the New Testament story and beyond in this revision of his bestselling work, Bethlehem to Patmos. Through this fascinating journey he shows that the New Testament is historically reliable on the life of Jesus and the early experiences of the nascent first-century church. About "Bethlehem to Patmos: The New Testament Story (2013)"
Paul Barnett (Ph.D., University of London) is the retired Bishop of North Sydney, and has taught at a number of prestigious academic institutions. Since his retirement, he is Honorary Associate in Ancient History, Macquarie University, Sydney; Lecturer Emeritus, Moore College, Sydney; and Teaching Fellow at Regent College, Vancouver. He was also Head of Robert Menzies College, Macquarie University. He is the author of some major commentaries on 2 Corinthians (Bible Speaks Today Series and The New International Commentary on the New Testament); 1 Corinthians: Holiness and Hope of a rescued people (Focus on the Bible); Mark: The Servant King, John: The Shepherd King, 1 Peter: Living Hope and Revelation: Apocalypse Now and Then (Reading the Bible Today). As well as a number of books on New Testament Background and the Historical Jesus such as After Jesus: The Birth Of Christianity, Is The New Testament History? (Revised 2004), Jesus and The Rise Of Early Christianity, The Truth About Jesus(Revised 2004), and Jesus And The Logic of History (New Studies In Biblical Theology). Most recently he has produced The Corinthian Question: Why did the church oppose Paul? (Intervaristy Press, 2011) and three volumes in the After Jesus series; The Birth of Christianity: The First Twenty Years; Paul: Missionary of Jesus and Finding the Historical Christ: After Jesus. Customer Reviews For "Bethlehem to Patmos: The New Testament Story (2013)"
Barnett walks the reader through the historical aspects of the time period of the New Testament. He explains the people, culture and major events of the time. This is a good introduction, since it doesn't get too involved in technical details, but still presents relevant explanation behind conclusions. 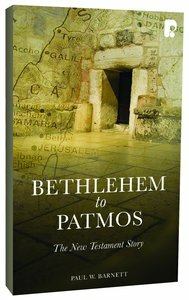 Bethlehem to Patmos will help readers understand how the events of the New Testament affected and were influenced by the events of their times. This book is well structured and gives an interesting perspective of the New Testament story. It is filled with interesting facts along the way and really makes the New Testament come alive and become real. I recommend this book for those that love the history surrounding the New Testament.